Many of the people that are first introduced to the work of artist Alexamder James are unaware of the complexities and scientific processes involved; despite having seen his works hanging in galleries on previous occasions. It is with these processes that his underwater sculptures are able to be presented as photographic works without the use of post production either traditional or digital. In a time where craftsmanship of highly skilled artisans has been exchanged to for mass production and a well branded label. For Alexander this is a driving force returning artist skills back into the studio. 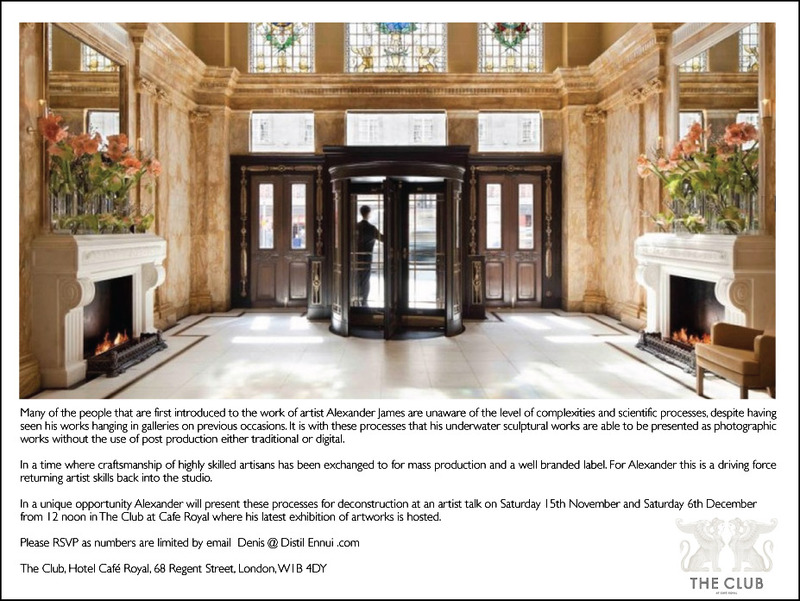 In a unique opportunity Alexander will present these processes for deconstruction at an artist talk on Saturday 15th November and Saturday 6th December from 12 noon in The Club at Cafe Royal where his latest exhibition of artworks is hosted.